A 52-year-old man presented to our clinic with severe intermittent claudication of the left leg (Rutherford class 3). The patient had a medical history of smoking and diabetes mellitus. A preoperative lower extremity arterial ultrasound indicated a long left superficial femoral artery (SFA) occlusion that was approximately 30 cm in length. Using echocardiographic guidance, percutaneous access was gained to the right common femoral artery, and a long, 6F, 45 cm Flexor introducer (Cook Medical) was used to achieve contralateral crossing. A 0.018-inch Asahi Gaia PV wire (Asahi Intecc Co Ltd.) was placed in the proximal left SFA to attempt antegrade crossing of the occlusion. 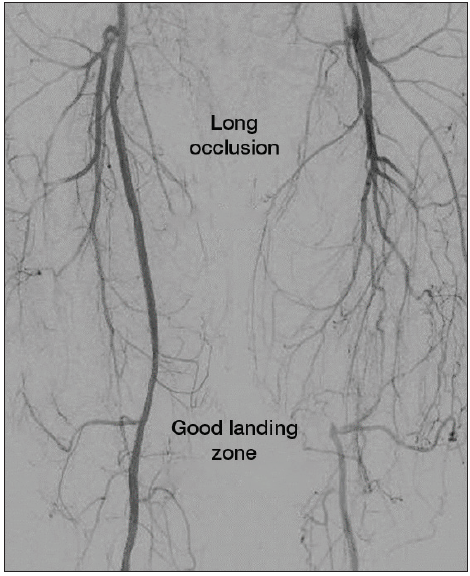 Angiography confirmed a long left SFA occlusion with an ambiguous proximal cap (Figure 1) but a good landing zone at the point of reconstitution (Figure 2). Figure 1. 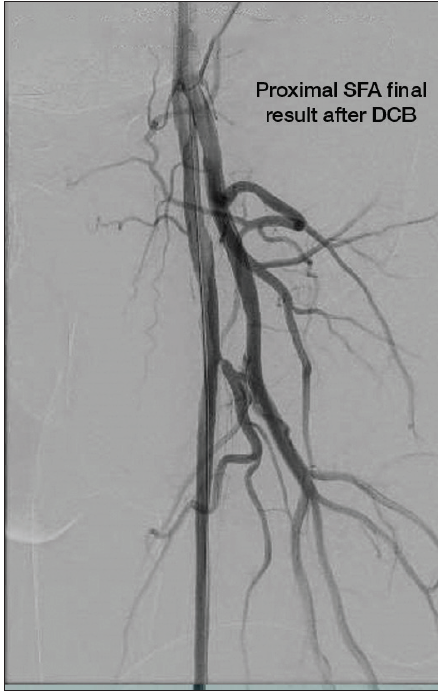 Angiogram showing the long left SFA occlusion with an ambiguous proximal cap. Figure 2. 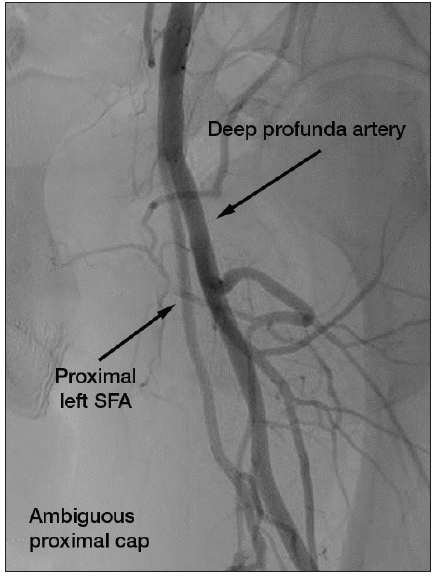 Angiogram of the left SFA showing a good landing zone at the point of reconstitution. The case presented many challenges given the ambiguous cap, the total occlusion, and the long lesion length. Key treatment considerations were the best approach to access the SFA given the ambiguous cap and choosing a device that could successfully cross and treat the long occlusion. We opted to proceed with a secondary access point from the left anterior tibial artery for retrograde crossing of the proximal cap of the SFA. For treatment, we decided to perform atherectomy using the DABRA Excimer Laser Atherectomy System (Ra Medical Systems, Inc.) because of its demonstrated ability to cross chronic total occlusions (CTOs) and safely treat long and complex lesions of all plaque types. The patient received a therapeutic dose of aspirin and clopidogrel the day before the procedure and 5,000 units of heparin the day of the procedure. With the antegrade wire still in place, under roadmapping guidance and using a 21-gauge needle micropuncture kit (Cook Medical), a retrograde puncture of the left anterior tibial artery was made. A long, 5F, 45 cm braided introducer was introduced in a retrograde fashion over a 0.018-inch guidewire. The wire was then removed, and a 5F DABRA catheter was introduced and progressively advanced in a retrograde fashion, from the distal to the proximal occlusion, until the proximal cap was reached. 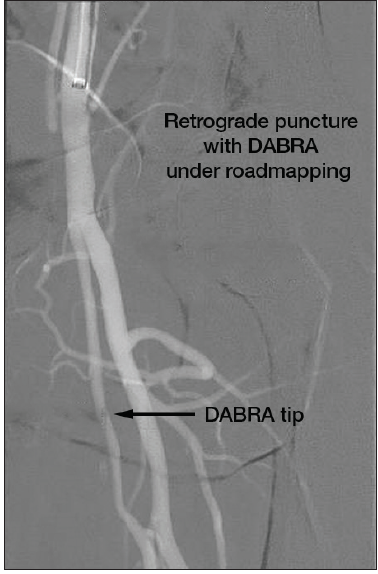 An angiogram was obtained, a slight advancement and lasing of the DABRA was made under roadmapping control (Figure 3), and successful retrograde crossing of the proximal cap was achieved (Figure 4). Figure 3. Retrograde advancement and crossing of the proximal cap with the laser. Figure 4. 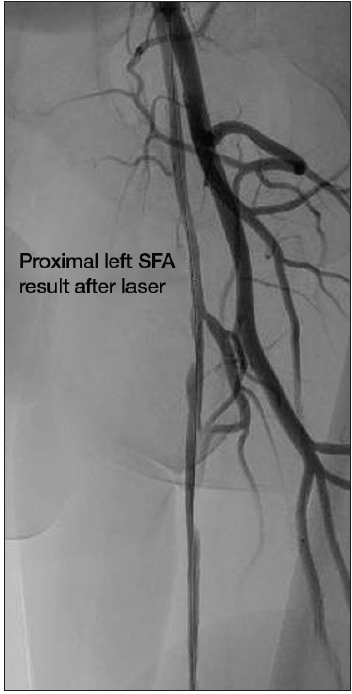 Angiogram of the SFA after successful retrograde laser crossing of the proximal cap. Figure 5. 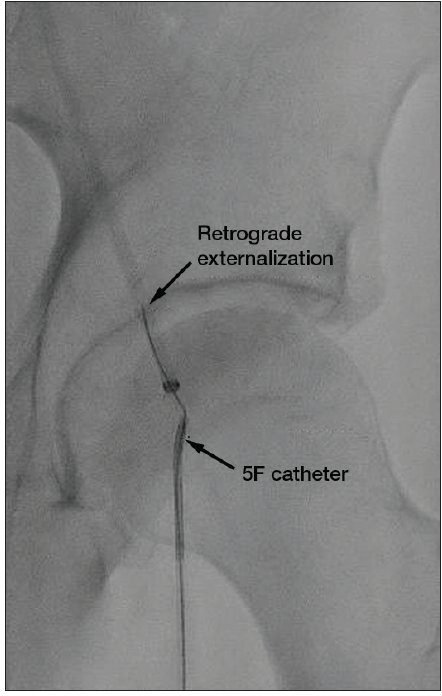 Retrograde externalization achieved with a 0.018-inch guidewire and 5F Berenstein catheter. The smooth channel created by the laser allowed us to easily advance a 0.018-inch V-18 ControlWire guidewire (Boston Scientific Corporation) in a retrograde fashion. Next, retrograde externalization was achieved with the 0.018-inch guidewire and a 5F Berenstein catheter (Cordis, a Cardinal Health company) (Figure 5), followed by a V-18 ControlWire guidewire exchange from an antegrade approach, using a 135 cm CXI support catheter (Cook Medical). With a successful wire exchange in place securing antegrade access, hemostasis of the left anterior tibial artery was performed with a combination of external compression and internal hemostasis using a 3.5 X 30 mm Emerge balloon (Boston Scientific Corporation) inflated for 10 minutes. Finally, antegrade treatment of the SFA was performed using a 5 X 100 mm Sterling balloon (Boston Scientific Corporation) inflated for 3 minutes, followed by two 5 X 150 mm Ranger drug-coated balloons (Boston Scientific Corporation) inflated up to 3 minutes. Figure 6. Final result with resumed flow through the SFA. Postprocedural angiography confirmed an excellent result with resumed flow through the SFA (Figure 6). The total procedure time was 90 minutes, which was relatively short given the multiple access points and overall case complexity. This case describes a successful bidirectional approach for laser crossing through a long SFA occlusion. Use of a retrograde approach allowed for direct and rapid access to the SFA occlusion and successful laser crossing, avoiding the likely increased procedure and fluoroscopy times of an antegrade approach given the ambiguous cap. Once the lesion was crossed and debulked with laser atherectomy, an antegrade approach was utilized for follow-up treatment. This case highlights the ease of use of the DABRA catheter, as this was one of our first cases with the device and it proved to be quite simple, even with the challenges of the case. It also demonstrates how the DABRA catheter can be effectively used as a crosser and an atherectomy device, because we were quickly able to cross the CTO and then lase the entire 30 cm lesion with just the one device.